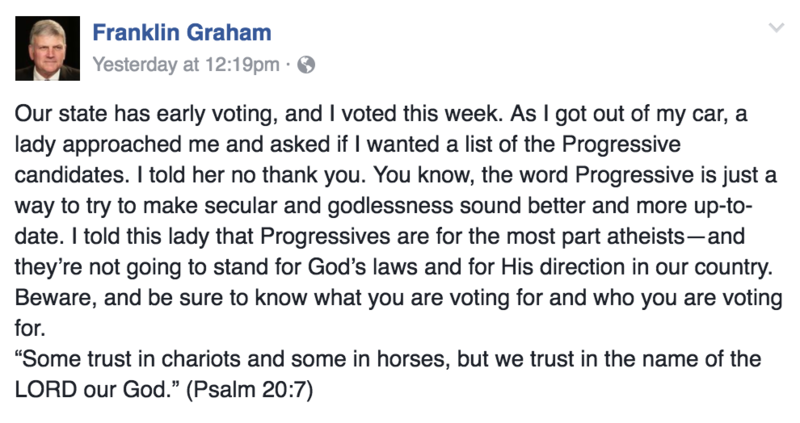 Evangelist Franklin Graham, yet another conservative Christian hypocrite who is throwing his weight behind Donald Trump, said in a Facebook post the other day that he rejected a list of progressive candidates when he voted early. Why? Not because he disagrees with us, but because it’s just a code word for atheists. You know, the word Progressive is just a way to try to make secular and godlessness sound better and more up-to-date. I told this lady that Progressives are for the most part atheists — and they’re not going to stand for God’s laws and for His direction in our country. 2) Damn right progressives aren’t here to legislate “God’s laws.” We actually care about people who are oppressed by Christians. What you do with your faith in the privacy of your home or church is your business. But if the best reason to have to get in the way of someone else’s civil rights is “Jesus said so,” we know better than to take you seriously. 3) It’s ironic that Graham thinks “secular” and “godlessness” are terms in need of modernizing when the demographic trends are all moving in our direction. If anything, “evangelical” is the word that needs a reboot, and that’s because people like Graham have made it synonymous with ignorance and bigotry. It is very entertaining, though, to watch Graham descend even lower into the depths of irrelevance. He’s pinning his faith to the sinking ship of a man who only sees faith as a tool to manipulate even more people. It’s not surprising that Graham got conned by Trump, too.